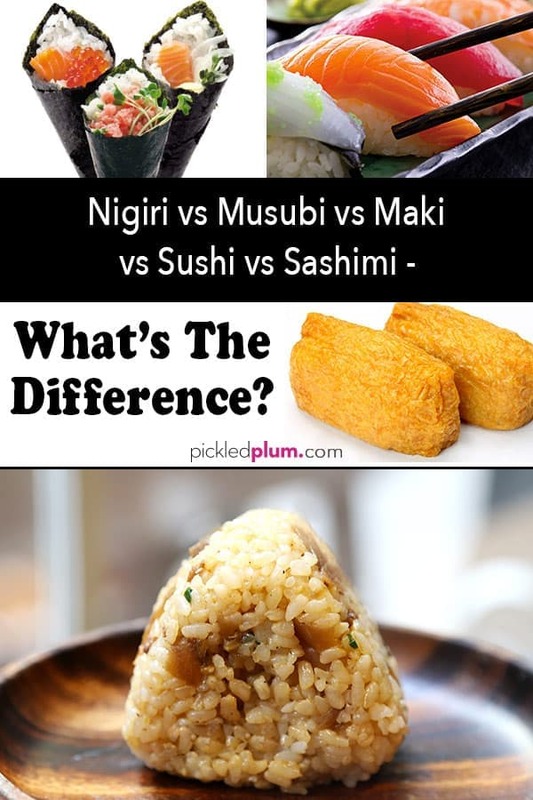 Nigiri vs Musubi vs Maki vs Sushi vs Sashimi – What is the difference? Find out what makes nigiri different from sushi and if musubi is the same as inarizushi! 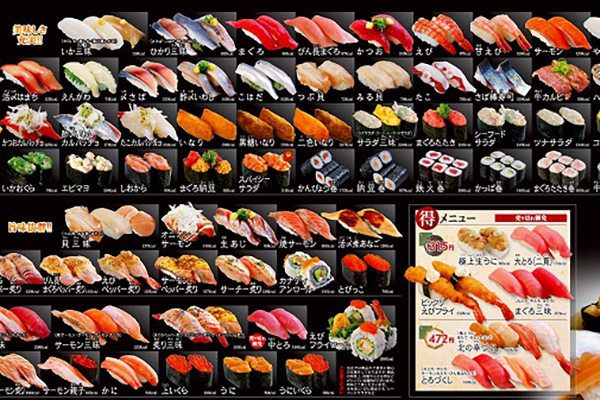 Here’s a quick guide to understanding Japanese sushi-related terms! What would you do if I gave you the option of having either nigirizushi, inarizushi or hand roll? Which one would you pick? Scratching your head? You’re not the only one. Ordering sushi can get a little confusing if you are not familiar with the terms. When I first moved to Japan I couldn’t understand the difference between the word sushi and, well, everything else! To me, sushi was fish over rice and inarizushi was a fancier version of nigiri. The only thing I knew for sure was that sashimi was raw fish without the rice. Then one day, as I was on my way to visit my mother, she called to tell me that “we are having sushi for dinner tonight”. “Sounds amazing! Can’t wait to see you mom!” I replied excitedly. As I stood a few feet away from my gate at Narita airport, I had visions of colorful pieces of oily fish floating all around me. I boarded the plane with an empty stomach, lit up a cigarette and dreamed about sushi. I’m kidding! Not only do I not smoke, I’m not from the 50s either. 90 minutes later, I was in Fukuoka, land of the tonkotsu ramen (pork based broth), world famous green teas, volcanoes and hot springs. By the way, if you’ve never been to Fukuoka, Kyushu (the southwesternmost and third largest island in Japan), add it to your list next time you go to Japan. Its subtropical weather and smiling faces alone will make you want to move there! To my surprise, I didn’t see sushi. Well, let me rephrase that – I didn’t see what I thought was sushi. You know, the individual pieces of fish sitting atop small mounds of rice? That was my definition of sushi. Instead, I saw tuna rolls, cucumber rolls, a couple of hand rolls and some inarizushi. Don’t get me wrong, I was still very happy about dinner! I just felt a little confused. Okay, I was more than a little confused. I was so confused that I asked my mom for a thorough explanation about sushi. My mother sat down and as she lightly dipped a piece of maki in nikiri (traditional sushi soy sauce), signaled to me that the lesson was about to begin. That evening I learned about the meaning of every term and what classifies as sushi versus what doesn’t. By the end of the lesson, I knew exactly what was on my plate. And as you are about to see, It’s really not that complicated! I’ll try my best to explain each meaning the way my mother did – by keeping it simple and to the point. I’ve also made an infograph you can save on your phone or computer should you ever need a quick refresher. Are you ready to soak up some knowledge? Let’s get started! Nigiri, or onigiri (the o- being an honorary prefix) is the same thing as musubi. The preferred term varies by household or region. For example, I use the word onigiri 95% of the time while my mother prefers the term musubi. Nigiri are rice balls molded by hand into a triangle or other shape, and flavored with various ingredients. The literal meaning for nigiri is to grasp or hold something. You can insert ingredients such as pickled plums, Japanese pickles, bonito flakes, tuna mayo or even your own teriyaki chicken in the center of the nigiri, and wrap it with a nori sheet. Other nigiri/musubi types can be served seasoned with just salt or some sesame seeds, and without any nori. Conclusion: Nigiri and musubi are the same thing. But what about Nigiri sushi (pronounced nigirizushi)? Nigiri sushi (握り寿司) is vinegar flavored rice shaped into small oblong mounds and topped with either raw fish, eggs or vegetables. They are usually served in pairs or can come on wooden trays as part of a set meal. It’s what we think of when we hear the word sushi – the classic one bite dish we’ve all come to love so much. What is sushi then (寿司, 鮨)? 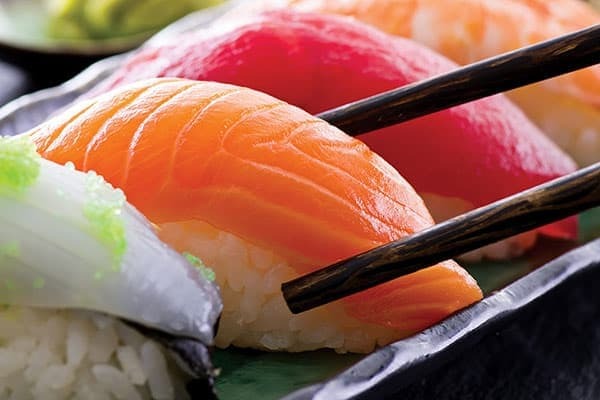 Sushi is rice seasoned with salt, sugar and vinegar. The literal translation of the word sushi is vinegar rice. It comes in many different varieties. Basically, sushi is a general word for any food that comes with vinegared rice. Therefore maki is sushi, nigirizushi is sushi and inarizushi are also considered sushi. Nigiri and musubi on the other hand are not sushi. What is maki 巻き, uramaki and temaki 手巻き (roll vs hand roll)? Maki are sushi rolls with nori (dried seaweed sheets) wrapped on the outside. 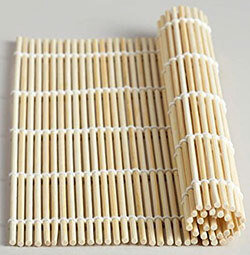 There’s futomaki (太巻き), which are fatter rolls containing more than one ingredients in the center. 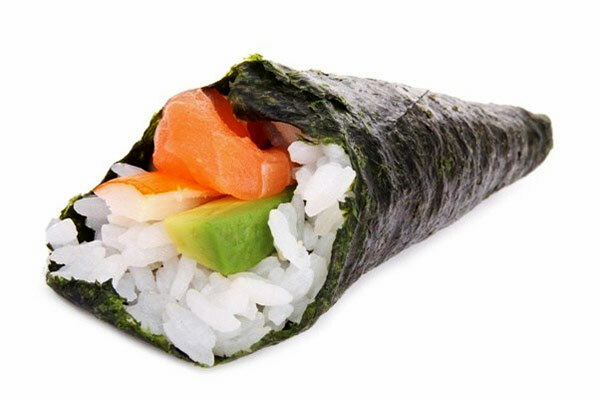 For example, California rolls are futomaki rolls. Then there’s tekkamaki rolls (鉄火巻) which are mini maki rolls with only one filling. Popular tekkamaki rolls include tuna rolls, salmon rolls and cucumber rolls. Uramaki rolls (裏巻き) on the other hand are inside out rolls where the nori is placed between the rice and ingredient of choice (fish, veggies). Most dragons rolls are served uramaki style. Temaki (手巻き) are hand rolls. They look like cones made with nori (dried seaweed) and stuffed with sushi rice and fish, cucumber, avocado and/or other ingredients. What is inari sushi (pronounced inarizushi)? 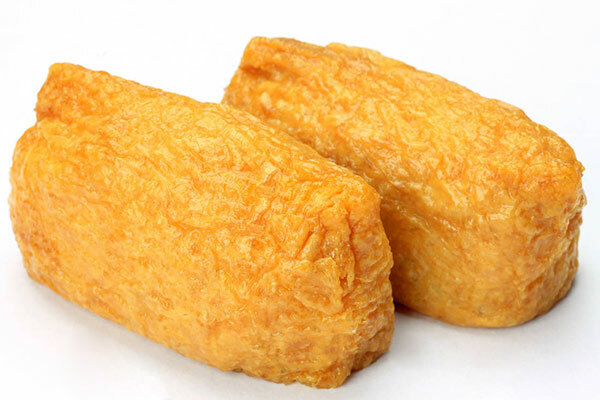 Inarizushi are fried tofu pockets filled with seasoned sushi rice. Unlike other sushi, inarizushi is sweeter than savory, and somewhat wet in texture. That’s because the fried tofu pockets, called inariage, are soaked in a mixture of dashi, soy sauce and sugar. They are then squeezed until most of the liquid is out and then filled with sushi rice. This one is the easiest to remember because there is simply never any rice involved. What most westerners know as sashimi are pieces of raw fish served with a side of pickled ginger and wasabi. 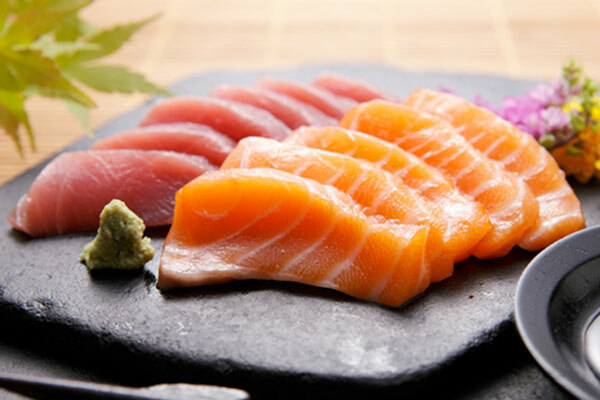 But sashimi can also be raw meat, chicken, tofu skin or even vegetables (as long as they are served raw). The term sashimi literally translates to “pierced body/meat”. It may derive from the culinary practice of sticking the fish’s tail and fin to the slices in identifying the fish being eaten. Here’s a quick help guide on how to make the best sushi at home so you can impress your guests at the next dinner party! Here in the US there are two types of Japanese rice available; there’s Japanese short grain rice called japonica, and medium grain California rice. When making sushi, short grain is recommended because it’s stickier than medium grain. 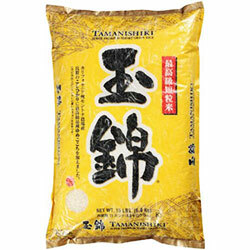 Popular brands like Nishiki, Botan and Kokuho are medium grain rice. So instead of going for one of those, look for brands like Tamanashiki or Koshihikari for high grade Japanese short grain rice. Did you know that most wasabi pastes served in American restaurants aren’t actually made with real wasabi? Chances are you have been eating mashed horseradish this entire time thinking it was wasabi. Real wasabi is yellowish green and instead of being hot, it’s sweet! Finding fresh wasabi can be hard but if you can get your hands on a piece, grate it right before serving. 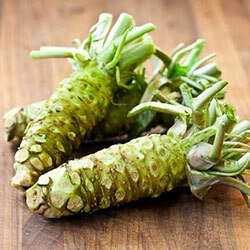 Fresh wasabi can only hold its strong flavor for about 15 minutes! 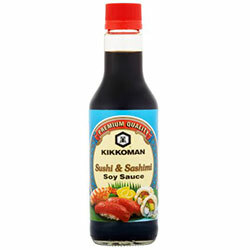 Most of the soy sauces sold in North America are the dark kind. That’s bad news for us because the flavor is way too bold for many delicate Japanese dishes, sushi included. Dark soy sauce lacks not only refinement but the subtle complexity of flavor found in artisanal soy sauces sold across Japan. In order for a beautiful piece of toro tuna to shine, you need a good nikiri sauce. Nikiri is not the same as general soy sauce in that it is sweeter and milder. It’s also slightly thicker in consistency, like a thin glaze. Nikiri sauce can be purchased at Japanese supermarkets or on Amazon. You can also make it yourself! Here’s a quick an easy recipe for you to try. Add sake and mirin to a small pot and bring to a boil. Add soy sauce and water, lower the heat and simmer until liquid has reduced by half. Let cool to room temperature before serving. Store in the fridge for up to a month. Well, because fish isn’t always needed to make sushi, I’m skipping that part. I’m giving you the basics to good sushi making – what you use as a filling is up to you. The filling you choose will of course have an impact on the overall taste of your dish, so always make sure to buy the freshest ingredients! 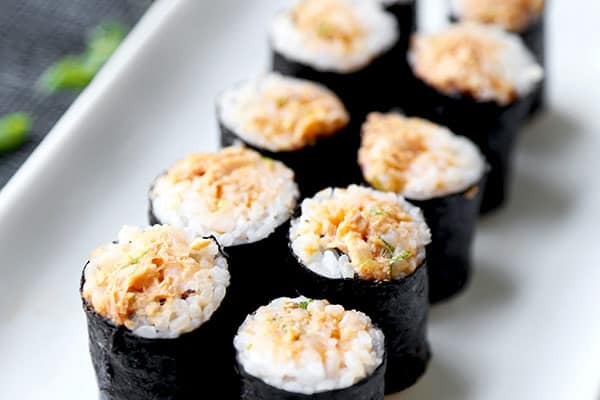 If you are an avid sushi lover you know that good rice is the cornerstone of good sushi. 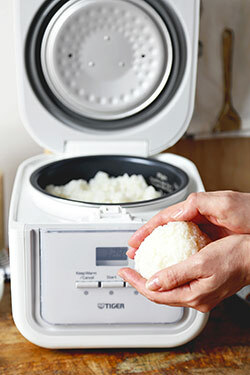 Making rice on the stove can be tricky but with a rice cooker, it’s a no brainer! Honestly, at this point in my life I cannot imagine life without a rice cooker. Especially since the one I have can also slow cook and steam! This little machine has simplified and changed the way I cook in the kitchen and my rice has never been more perfect! 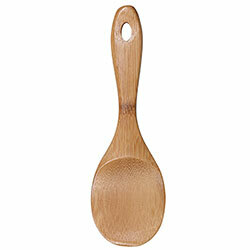 Plus, most of them come with a rice paddle, a ladle (I make soups and stews all the time) and a cookbook! A hangiri is used to fluff and season the rice once it’s cooked. 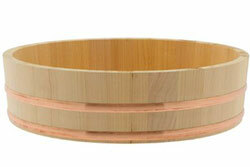 It’s made of hinoki (Japanese cypress) and soaked in water before being used. The rice is then spread, seasoned with rice vinegar and mixed with a paddle. Once the rice is evenly seasoned, it’s covered with a towel to prevent it from drying. What makes hangiri so special is the ability to absorb the excess moisture from the rice and give it the perfect texture for sushi. 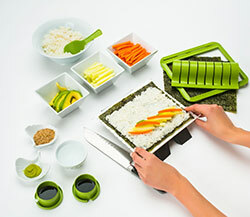 You will need a rice paddle to fluff the rice and to transfer it from pot or rice cooker, to bamboo mat or the palm of your hand (if you make nigiri sushi). If you buy a rice cooker, it will come with a rice paddle. If not, you can get one on Amazon or purchase one at your local grocery store. These are amazing! And by the way, I know a lot of Japanese people who use sushi molds, so don’t feel like this is an amateur western chef’s move! 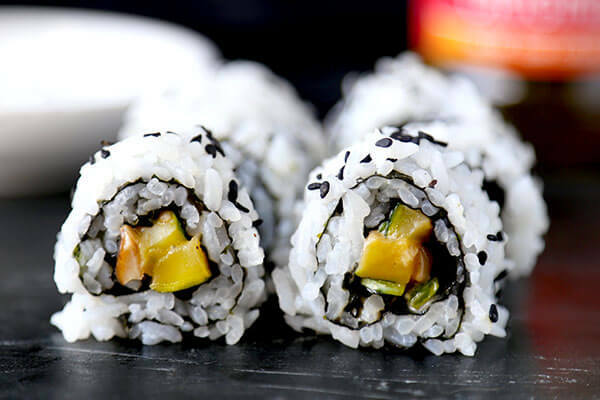 They are so useful and make the whole maki making process literally pain-free! Thank you for ALL of the information! I am confused about the Nigiri portion of the blog. 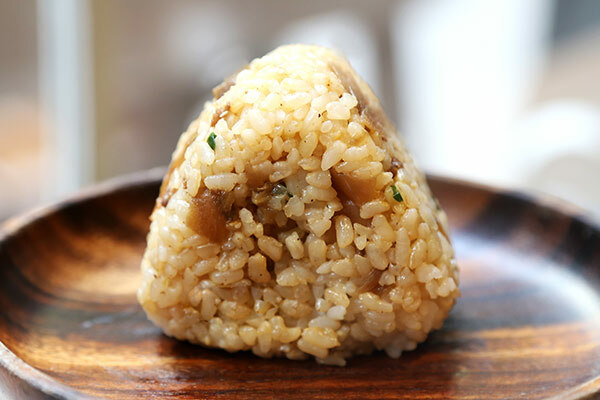 In the very beginning under the heading of “Nigiri vs Musubi”, there is a photo of the rice ball with the description “Nigiri are rice balls molded by hand…..and flavored with various ingredients”. Further down under Nigiri vs Musubi vs Maki vs etc., there’s a photo with different types and descriptions of about 8 items. In the lower left corner is the sushi. The description reads, “basically sushi is a general word for any dish that comes with vinegered rice. Therefore, maki and nigizushi are sushi. Nigiri and omusibi are not.” Please help me to understand, because in the first description, I understood that Nigiri IS the flavored Rice? Will be visiting a high profile Japanese restaurant in the near future, and would like to understand what I’m ordering. Thank you in advance for clarification as well as ALL of the great advice! Hi Sammie! The difference is in the rice. Nigiri is flavored with ingredients but the rice itself isn’t. So nigiri can come with a bonito flake or pickled plum filling but the rice is not seasoned with vinegar. Thank you for this much needed info. I love it all regardless of the name. I love your site. You have some very good receipes. I am always interested in learning the origins of food names as well as food culture; I enjoyed your post. I enjoyed learning about the different names for what we often just call “sushi”. Curious that you made no mention of chirashizushi, which is made with sushi rice and various ingredients typical found in nigiri sushi. Perhaps those are also recent inventions here in the United States? It is fascinating how differs countries adapt something from elsewhere, with results that are similar, but not identical. Thanks Caroline. I’ve a passion for food culture, particularly Japanese,, so I enjoy your blog. I’ve especially appreciated the recipes.